MOSCOW, April 10. /TASS/. Russia’s Federation Council on Wednesday approved a statement saying that violations of the rules of navigation by Ukrainian ships in the Kerch Strait are fraught with a military conflict with Russia in which NATO may be involved. "The passing of Ukrainian ships through the Kerch Strait is not a question of the balance of force or of NATO’s presence in the Black Sea region. It is exclusively a problem of Ukraine’s compliance with the established procedures that are well-known to it and had been successfully used by it up to November 2018. Ukraine’s attempts to bypass these procedures are fraught with the risk of a military conflict between Ukraine and Russia in which NATO may be involved," the Federation Council said. The senators pointed out that after stepping up activity in the previously calm Baltic Region NATO was now building up military presence in the Black Sea region. "NATO’s support for Georgia during the tragic events in August 2008 and now for Ukraine, in particular, on November 25, 2018 when Ukrainian naval ships illegally crossed the state border of Russia in the Kerch Strait area incites the leaders of these two countries, certain about their impunity, to carry out more adventures," the statement runs. On November 25 last year three Ukrainian naval ships left the port of Odessa to head for the Sea of Azov. While passing the Kerch Strait they violated the mandatory rules of navigation through Russia’s territorial waters. The ships ignored the Russian border guards’ orders to stop. Weapons had to be used to make them shut down the engines. Three Ukrainian military servicemen were slightly injured. The ships were detained and their crews arrested. Russia opened criminal proceedings over the violation of the state border. Ukrainian President Pyotr Poroshenko used the incident to declare martial law in the whole territory of the country for 60 days, which implied at least a postponement of the presidential election scheduled for March 31. All of the country’s political forces responded with angry protests. In the end Poroshenko had to backtrack. Martial law was reduced to 30 days and applied only to border regions. 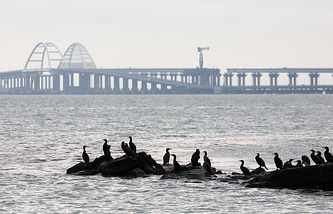 Moscow interpreted the Kerch Strait incident as a provocation by the Kiev authorities in order to try to bolster the incumbent’s low rating ahead of the presidential election.